If you're paid monthly, it probably seems like a long, long time since your last payday. Now that it has finally arrived, you might want to treat yourself - even if you're on a low-buy for 2019! I'm definitely being more mindful with my spending this year but there's no way I could do a no-buy and I'm not doing a set 'low-buy' budget - just waiting until something really catches my eye! Today, I have three great products for three budgets, which will hopefully serve as some inspiration if you do plan on buying something this payday. Ainsel Lipsticks: I'll be honest, I hadn't actually heard of cruelty-free brand Ainsel before they contacted me last November but I liked their quirky packaging and I'm a sucker for a nice lipstick. The clear packaging can be customised with stickers to suit your own personal taste, but it's what's inside that counts. These lipsticks are extremely pigmented - one swipe is all that is needed to achieve full opacity. 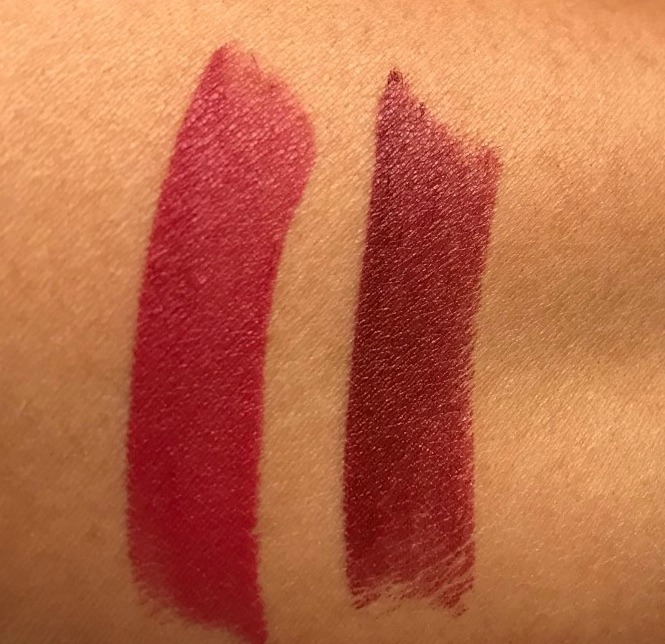 The texture is so creamy, which makes them some of the most comfortable lipsticks that I have ever worn. I find that they last around 6 hours on me before they need to be reapplied and they don't feather or cling to any dry patches. Really gorgeous lipsticks that I'd recommend if you're in the market for a new shade. £24. 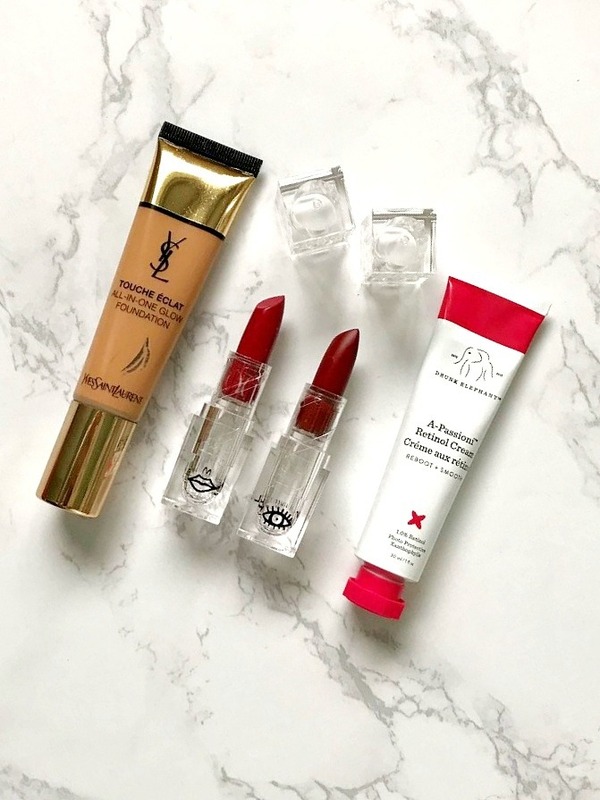 Yves Saint Laurent Touche Éclat All-In-One Glow Foundation: When the original Touche Éclat foundation was released around 6/7 years ago, I snapped it up immediately because I have been a fan of the concealer/highlighter pen for years. I absolutely loved the finish of it but it broke my skin out so badly and I was gutted! I really don't know which ingredient it was that affected me so badly because I have used 2/3 other YSL foundations without any issue. When this new version was released last year, I held off buying it for a long time in case I would have the same issue but we all know that I'm a sucker for a glowy base so I eventually gave in and ordered it. This foundation has a light creamy texture that works well with brushes or a beauty sponge but at the moment, I am enjoying applying foundation with my fingers as I find that it really meshes well with my skin. The coverage is medium and the finish is glowy but without the disco ball effect. It just makes my complexion look healthy and luminous. I find the wear time to be pretty good - at around the 8/9 hour mark, I notice a bit of fading but it doesn't cake and can be touched up easily. It's perfect for anyone with dry skin as it's formulated with 70% water, hyaluronic acid and Vitamin E - all skin-loving ingredients. If you have normal or dry skin and are looking for a new foundation, I really recommend trying this. £33.50. Drunk Elephant A-Passioni Retinol Cream: I have a full review of this coming next week so I won't go into too much detail at the moment but this is a product that gives overnight results so if your skin is looking dull or slack, this could be the product for you. It contains 1% retinol in a silicone-free cream formula and, as with all Drunk Elephant products, it is free from essential oils, alcohol, SLS, fragrance, dyes and chemical screens). Full review coming soon. £62. Will you be buying anything this payday? Are you on a low-buy this year? I'd love to hear! All products are bought by me, unless otherwise stated. The Ainsel lipsticks were kindly sent to me but this is not an ad as I was not paid to mention them. Please see ASAI rules for bloggers in Ireland here. Opinion is always my own. Affiliate links may be used.